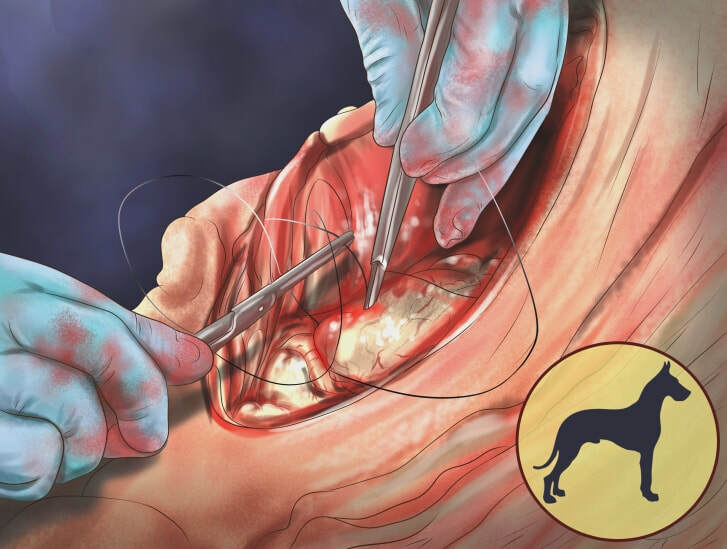 ​Gastric Dilation-Volvulus (GDV) or gastric torsion is the twisting of the stomach inside the dog, which can lead very quickly to severely life-threatening complications and death. Bloat is the filling of gas inside of the stomach and intestines due to gastric torsion and MUST quickly be relieved if there is any hope of reversing the torsion and saving the dog's life. It is unfortunately one of the worst realities of having a Great Dane in your family, as torsion and bloat is considered the #1 cause of death in the breed. However, recent university studies are beginning to uncover more information concerning the nature of the condition as well as both congenital, environmental, and dietary factors which can lead to the condition. This research is leading to the development of new treatments and warning signs to help Great Dane owners and Veterinarians to save more and more dogs. A surgical procedure known as Gastropexy can be performed to prevent such occurrences of GDV. The purpose of a gastropexy is to create a permanent adhesion between the gastric wall and the abdominal wall. Ideally, a gastropexy should create a strong adherence, have minimal complications, not affect the stomach's natural orientation or markedly alter gastric outflow, and require minimal postoperative management. Gastropexy is usually performed by attaching the pyloric antrum to the right abdominal wall to prevent further gastric rotation. Please consult your veterinarian and a veterinary surgeon about the best and most appropriate preventative measures for your dog.